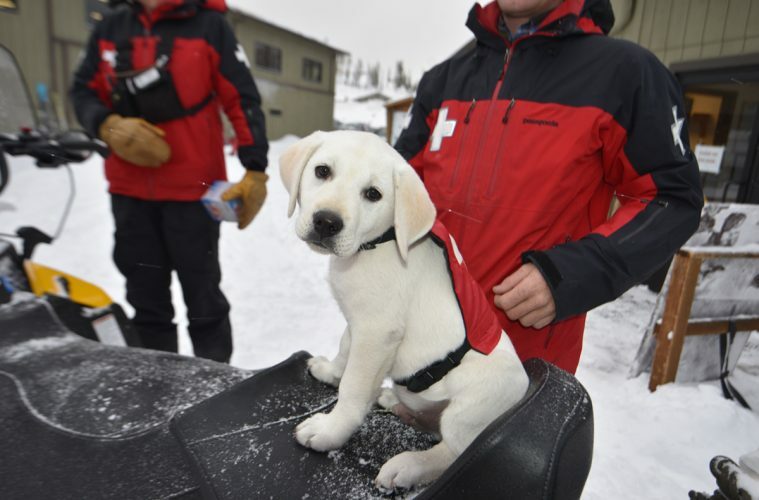 When I meet Glen, a fuzzy 5-month old yellow lab puppy and Monarch Mountain’s newest avalanche dog, it was hard to imagine that in a couple years he would be able to save lives. Right now, he’s a bundle of sweet joy interested in playing, giving kisses and licking feet. But, as we settle in for the interview and he sits at the feet of his handler, Mike Collette, I notice something different about him: unlike most tiny puppies he oozes calm even though we’re in the middle of a busy coffee shop. In addition to his intelligence, medium build and the fact that he comes from a strong hunting line, Glen’s calm demeanor is the characteristic that drew Mike to Glen. 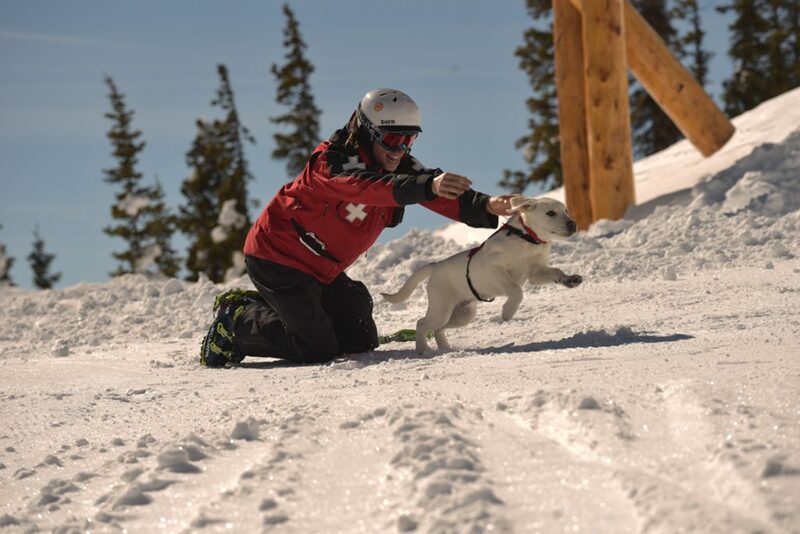 A ski patroller for 10 years who pulled stints at Heavenly and Winter Park before coming to Monarch in 2015, Mike has worked with rescue dogs in the past, but never had the opportunity to train his own. 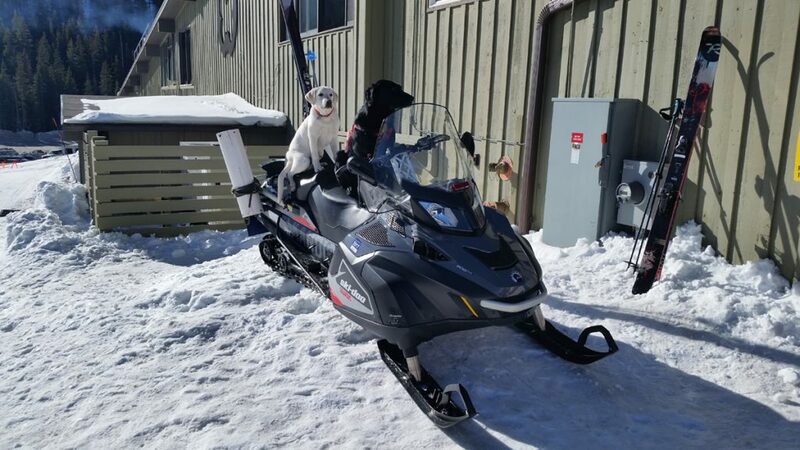 So, this year when one rescue dog at Monarch retired and a second moved to another resort, patrol staff thought it was the perfect time to grow the program with a new puppy-in-training. With the support of his supervisor and the rest of the team, Mike jumped at the chance to be the primary trainer for this new member of the Monarch family. 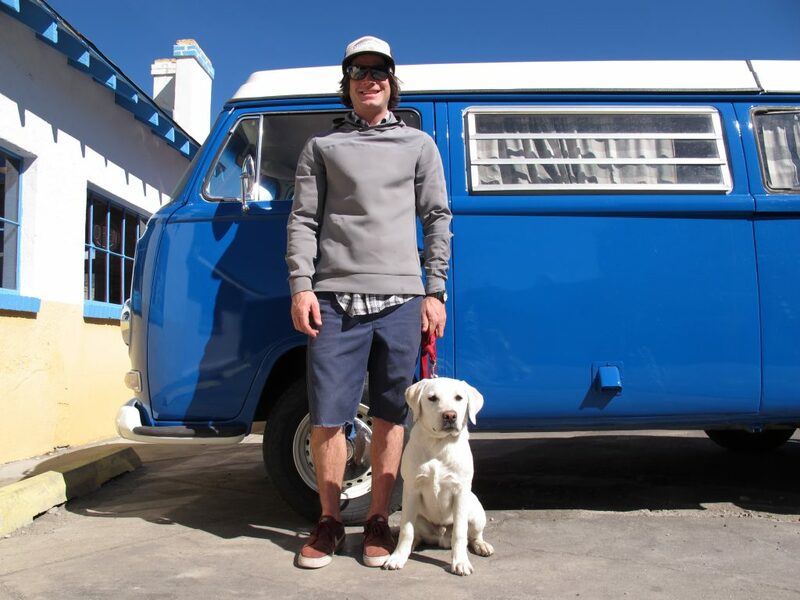 Mike picked his puppy up from Colorado’s Finest Kennels in Russellville, Colorado on November 23, 2016 and named him after two Glens who played a role in his life: an awesome family friend, and Glen Plake, a skier he admired as a kid and got to meet during his time at Heavenly. We caught up with Mike and Glen, the amazing avalanche puppy-in-training to find out what they’ve been up to over the last few months. Glen and Mike take time out of their rest day to meet up with us in Salida. EO: What has it been like since you came to live with Mike? 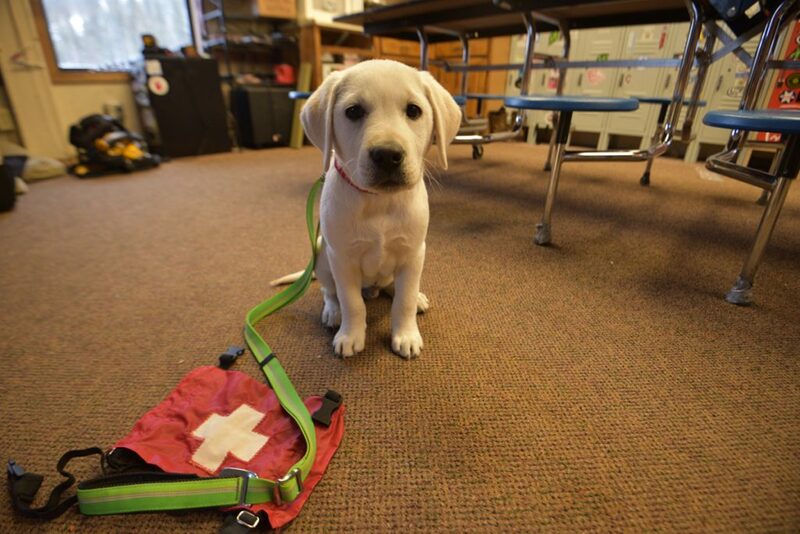 Glen the Avalanche Dog: When Mike picked me up, I just turned 8 weeks old and almost right away, we started training. We headed up to Monarch for the first day of set up and I’ve been going up there 4 days a week since. It’s been fun since I’ve gotten to try all sorts of new things. I’m really good at snowmobiling – I just chill in Mike’s lap and look around while someone else drives. I’ve also started training on the dog stream, a toboggan attached to the back of a snowmobile. I’m learning how to lie down alone in it while the snowmobile pulls me. This is a key skill I have to learn for situations where Mike wants me to go with him, but he doesn’t want me running next to him. Mike says I’m almost ready to try out riding the chairlift! Anxious to explore the mountain, Glen and Anchin, another Monarch rescue dog, wait patiently. EO: How did you become trained as a handler? Mike the Handler: From my 10 years on patrol, I have experience working with dogs. I was a tech for a couple other dogs in the past so I feel comfortable working with rescue dogs and I know how to talk with them in the right way. It isn’t a formal process, but if you show interest in training rescue dogs and get experience by being a “victim” for other dogs and then being a tech, you learn what you need. Glen is my first avalanche dog and I’m so psyched for the opportunity. 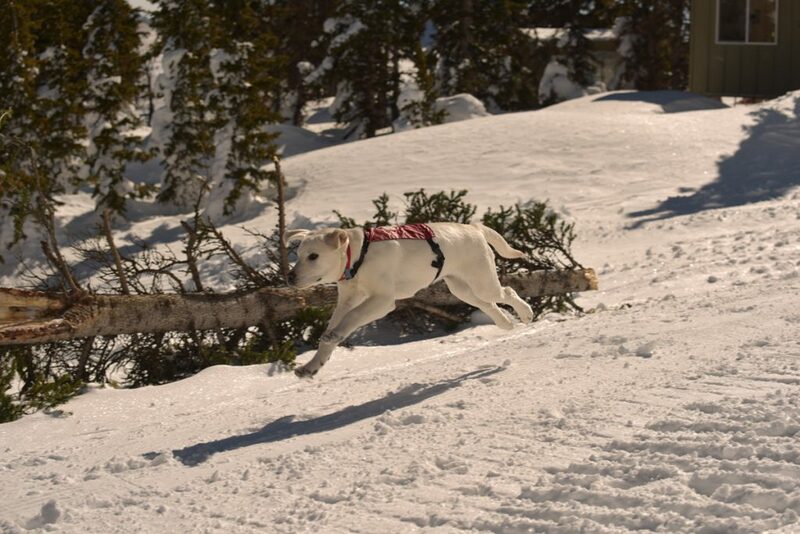 EO: What role do avalanche dogs play at a ski resort like Monarch? Glen the Avalanche Dog: We have areas like Mirkwood where we do mitigate and try to prevent avalanches, but we can’t say for sure that a slide won’t happen. People from the resort have access to these areas and though we do encourage people to wear avalanche gear, it isn’t a requirement. If there is an avalanche, dogs like me can be very helpful especially if people aren’t wearing beacons or don’t have a chip in their clothes or we don’t know how many people might be caught. Dogs like me can really help in sniffing out skiers who’ve been buried so Mike can find them and dig them out in time. Mike the Handler: Ultimately, Glen’s there to help us save lives. But, another important aspect of his job is how much he helps with public relations. People love him and love meeting him so it helps us do our jobs in educating people and keeping them safe to prevent something bad from happening. EO: What is your training like? Glen the Avalanche Dog: I’ll be training really hard this year and next. Since I’m little, we’re still mostly working on obedience training and we’ve started playing games of hide and seek. We also do this drill called “runaways” where Mike takes my favorite toy and runs away with it. I have to stay until I’m given a command to come find it. This is an engaging game that is getting me ready for when I really have to find someone buried in the snow. Mike always makes my training a big game and there’s always a reward so when I go to work it’s always fun and something I look forward to – not something stressful. Training made fun! 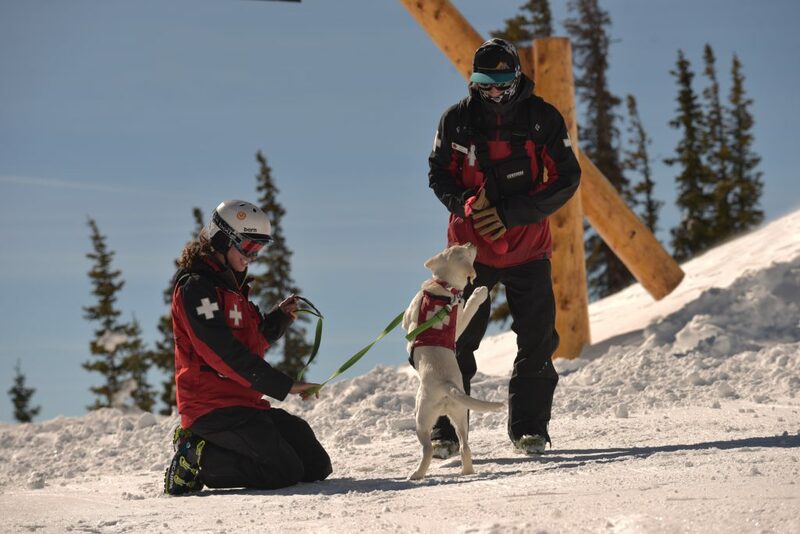 Glen doing drills with the amazing handlers of Monarch Ski Patrol. EO: What’s your favorite experience with Glen? Mike the Handler: He’s doing really well with all the things we’ve thrown at him so far. Every time we do a training, he’s just picked it up with no problem. The dog stream, riding the snowmobile, meeting strangers – he just does it all with no problem and he stays really calm no matter what. He’s exceeding my expectations on that front and just the way he handles himself has been awesome to see. Another memorable moment was being in the clinic with him and having a young person come in who was just howling in pain. Glen gave him a little love and totally calmed him down. That was amazing to see. Glen waiting to give love to visitors of the clinic. EO: What is a typical day like on the mountain for you? Glen the Avalanche Dog: Each day is different. Some days I hang out in the ski patrol clinic at the base and I give love to anyone who comes in hurt. Sometimes I ride a snowmobile up to the top and hang out at whatever lift Mike is assigned to cover. When that happens, I hang out with other patrollers and I get to meet skiers and make people smile. EO: What are Glen’s favorite activities? Mike the Handler: Other than training, he loves playing with one of the other avalanche dogs, having fun, rolling around in the snow and playing with toys. Basically, Glen just likes to party. EO: How has it been different raising an avalanche dog versus your other dog? Mike the Handler: The biggest thing I’ve had to get used to is being a little less hands on and being okay with other people taking care of him. When Glen’s at work, he’s every patroller’s dog — he’s a ski patrol dog — so I have to detach myself, but I don’t worry about him because I know everyone has his best interest in mind. We are a smaller team, but we are a family and I feel comfortable with everyone taking care of him. It’s been incredible to be able to lean on my team for help with his care and training. EO: What’s the ultimate goal for you and Mike? Glen the Avalanche Dog: In the next year or two, we want to earn our certification at Monarch. To pass this test and show my handlers that my skills are up to par, I have to find two buried victims within a few minutes of arriving on the scene. I have to alert Mike to where they are in an obvious and clear way. Each dog has a different way of indicating that they’ve found a victim and I don’t know what mine will be yet, but once I figure it out I will always use the same indication to show Mike I’ve found someone so he will know that he should start digging. We think I’ll be ready for this test by mid-season next year, but it varies from dog to dog. Then, we’ll continue our training to earn certification under the Colorado Rapid Avalanche Deployment (CRAD) program. This is a hard certification to get, but if we pass, it would mean that a helicopter could come to Monarch, pick up me and Mike (or another handler), and take us to meet a search and rescue team responding to a backcountry avalanche. The test to qualify, which is held at another ski resort with certified proctors, is a bit more difficult since I have to find two people and a separate scented article in a larger area. But, the extra work will be worth it so we can help even more people. Glen is a delight! Monarch is a wonderful little mountain defiantly worth a visit. Super fun article! I love the voice you’ve given Glen. Thanks for reading and the great feedback, Regina!